The “O” is for oats. These treats are to DIE for. Incredibly easy and layered deliciousness. I’m taking them camping this weekend. If they last that long. I love recipes where the finished product seems like more work than it actually took. Shhh. It’ll be our little secret how simple these are. Start with a jelly roll pan and line it with foil, then a single layer of graham crackers. 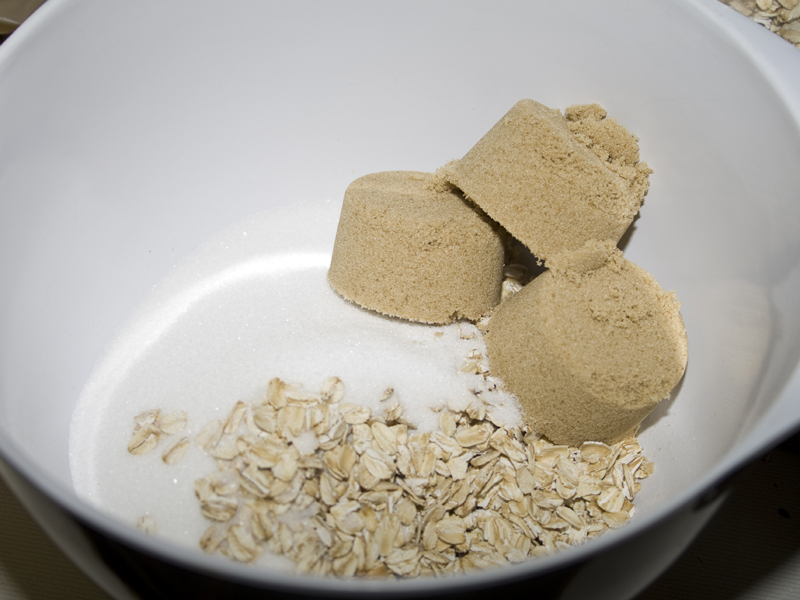 Mix up some oats, sugar and flour. Then mix in an egg and some butter (mmmmm – melted butter). Spread over the grahams. Don’t worry about getting it totally perfect. As it bakes it will spread and layer itself nicely. 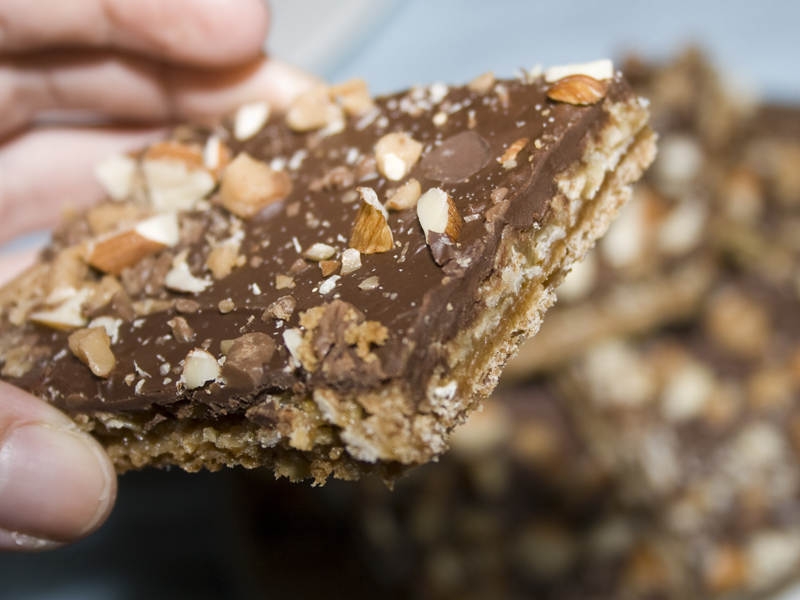 Bake until golden, then top with chocolate, almonds and toffee chips. 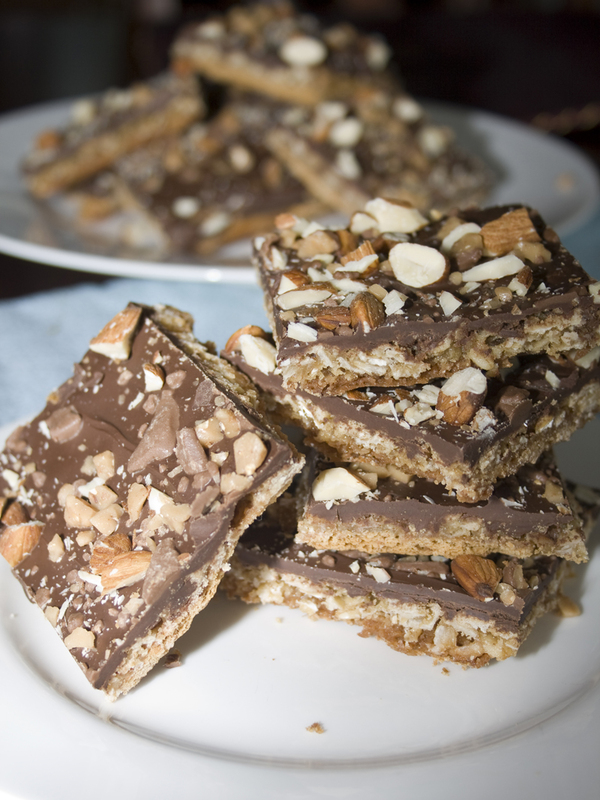 Break apart into bars or chunks and shove into your face. These bars are perfectly balanced. 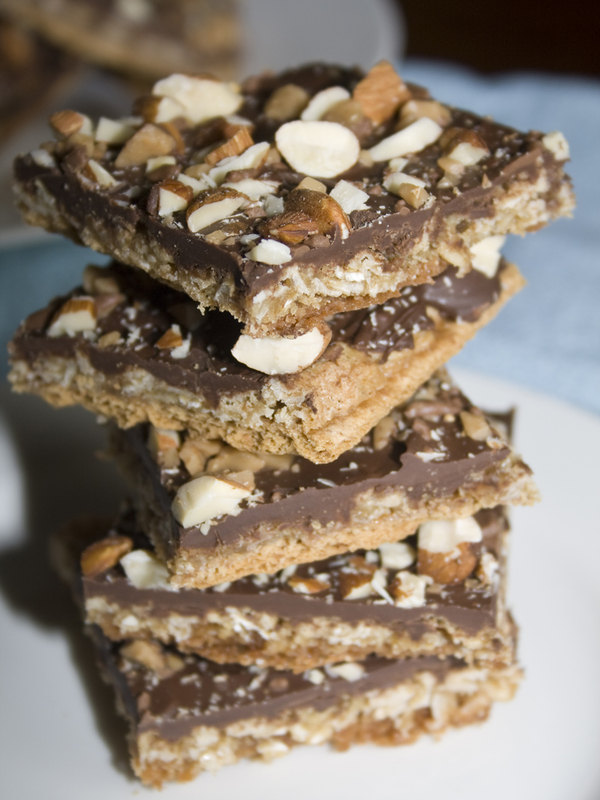 They have sweetness and crunch in all the right places plus the earthy goodness of oats. They are a great camping food. Especially if you’re going somewhere you can’t have a fire. 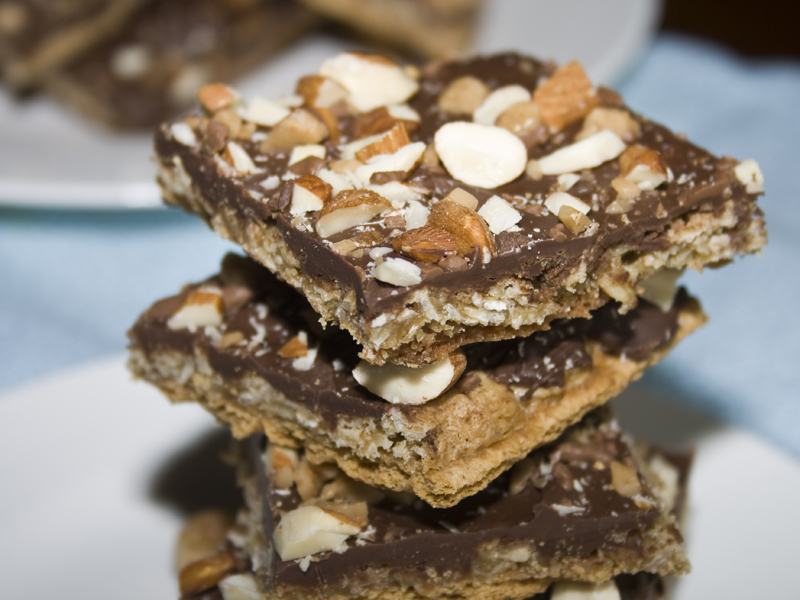 They are a little reminiscent of smores, except better, because they’re toffee. I love caramel buttery toffee. (happy sigh) Enjoy! Preheat oven to 350 degrees F. Line a 15x10x1-inch baking pan (jelly roll pan) with foil, extending foil beyond edges of pan. 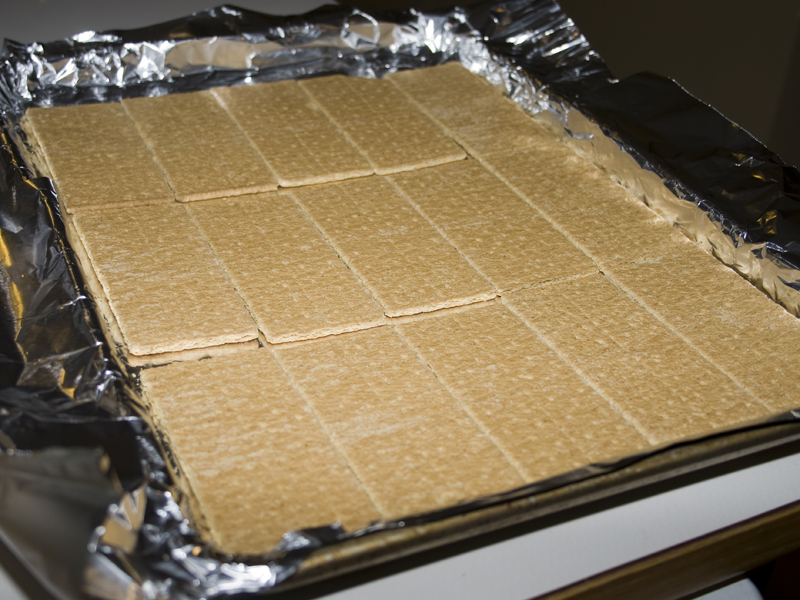 Arrange whole graham crackers in a single layer in prepared pan. In a large bowl combine the oats, sugars, and flour. Stir in melted butter, egg, and vanilla until well combined. 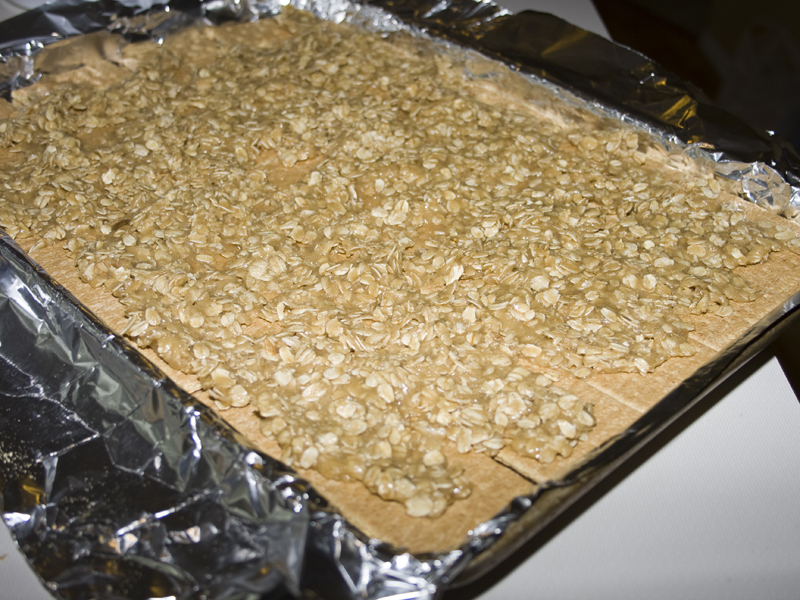 Spoon over graham crackers and spread evenly to edges of pan to cover graham crackers. 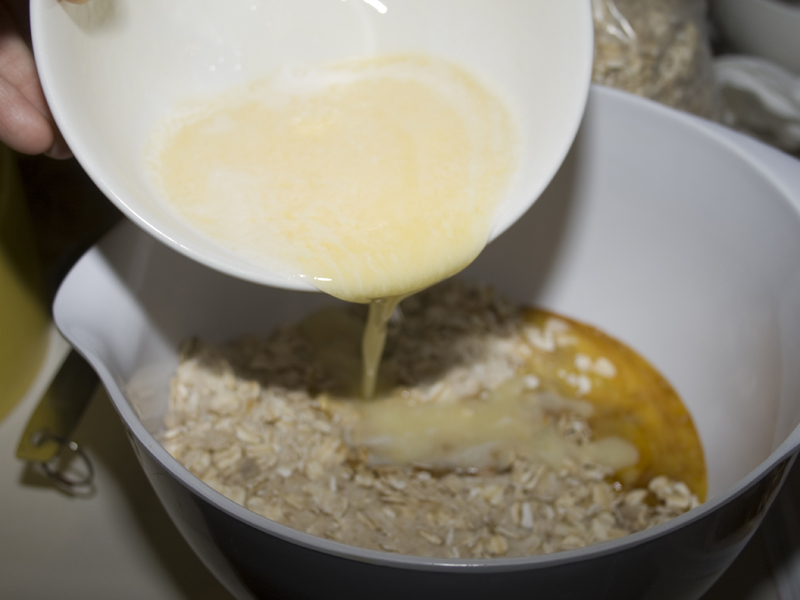 Bake for 20 to 25 minutes or until oat mixture bubbles and is lightly browned on top. Remove from oven and sprinkle with chocolate pieces. Return to oven for 1 minute. Spread melted chocolate over top to cover. 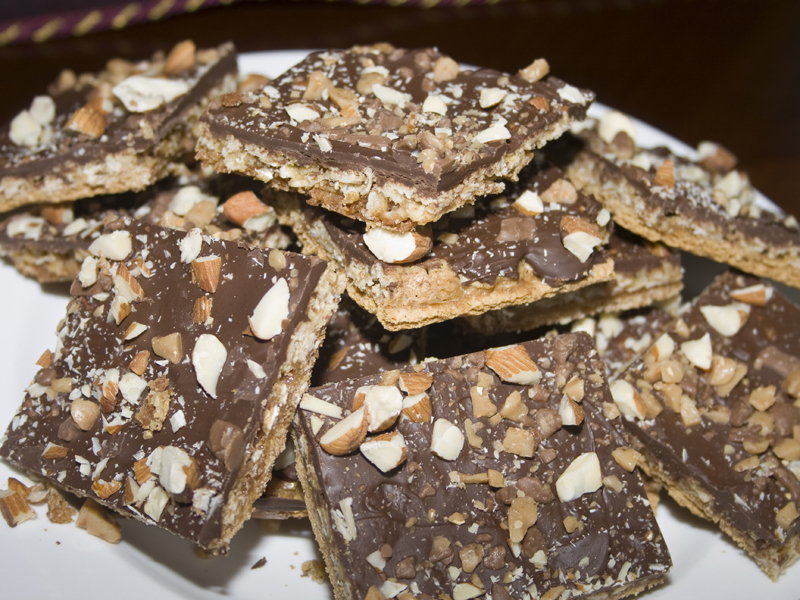 Evenly sprinkle with almonds & toffee chips. Cool in pan on a wire rack. Use foil to lift from pan. Remove foil. Cut or break into bars. Makes 30 bars. Mexican food is a big time favorite in my house. We have some variety at least once a week. And it seems that whenever I make tacos, I always have leftovers. Not enough really for another meal though. I hate throwing food away, leftovers especially. I mean, I already made all the stuff right? What a waste! So, I borrowed an idea from “Just Us” using wonton wrappers and my leftover taco stuff to create a quick and easy lunch. Used up all my leftovers, but put a new spin on them so I wasn’t bored with my food. I hate being bored with meals. Banana bread is delicious. Most of the time I can polish off half a loaf by myself easily. However, on rare occasions, I just want a little nibble of it. These mini banana bites are perfect for satisfying my hankerin’ for just a smackerel of something. They are packed with big banana flavor in a sweet perfect mouthful. These make a great take along snack too since no utensils are needed!